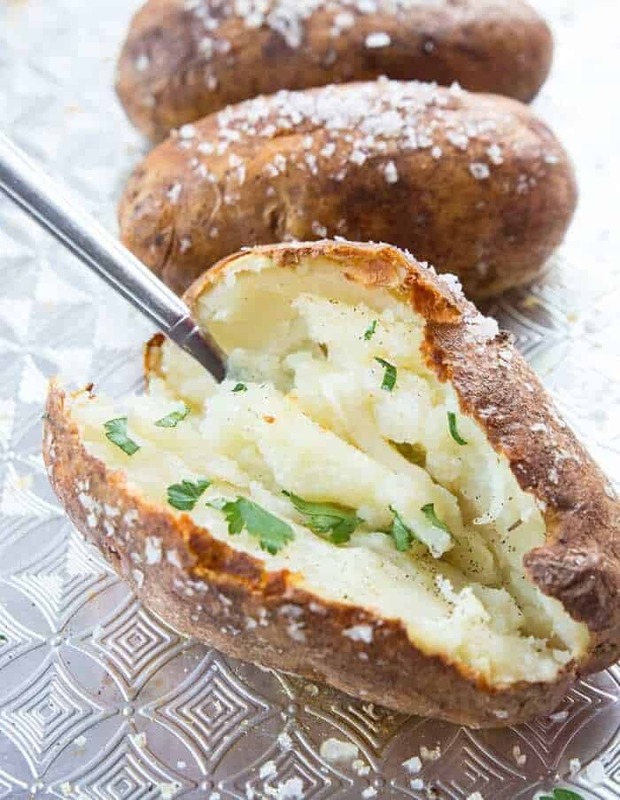 The secret to the best baked potato recipe is making baked potatoes that have a delicious salty, crispy outside skin that you and your family are going to want to eat! This is how most restaurants make their oven baked potatoes Just look at the photo below and take in the splendor that a crispy baked potato skin is. 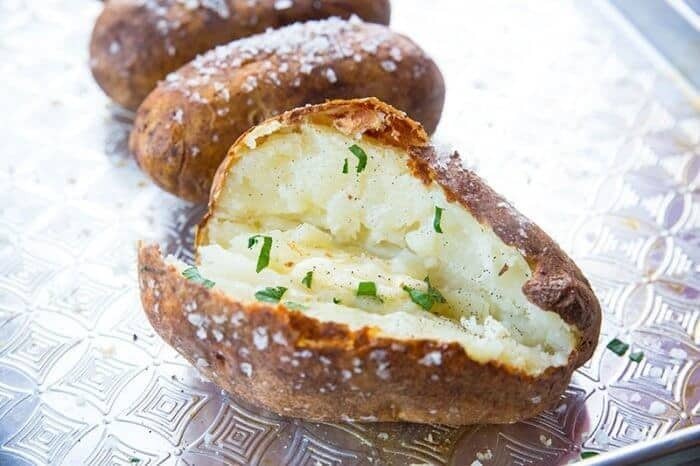 These are perfect baked potatoes, a crispy edible potato skin exterior that is left after you scoop out that fluffy, butter-soaked potato interior. This post has been updated from 2010, so if you have seen it before you are a long-timer – and thanks for being a reader here for that long! I’ve learned a few tricks from some fellow Edmonton chef friends that are going to rock your baked potato world! You would think that baking a simple potato wouldn’t have so many questions around it, but like anything else in cooking and baking, there are factors that affect the best way to make them! Here are a few basics for baking potatoes that will help you make the best tones ever! A baked potato is also called a jacket potato and they are the same thing. They are both potatoes baked in the oven or BBQ even until they are soft and fluffy inside. When a baked potato is properly cooked, you are going to have a crisp outside and soft inside that fluffs up perfectly when you take a fork to it. The true measure of a good baked potato is that you don’t need all of the fixings on top – the ones I make in this recipe were so good with just butter on them. We will get into types of potatoes that will affect your results below! Baked potatoes take longer to cook than you think they are going to. Every single time. There are many variables when it comes to baking potatoes, such as size, shape, water content of each potato that you are going to have to be flexible. with your time. You don’t want to wrap your baked potatoes in tinfoil. That’s an okay way to bake them over a campfire to protect the skins from burning but they skin won’t crisp up. What is the BEST baked potato recipe? I am going to claim that this baked potato recipe is one of the best because I had a lot of advice from chefs that know their stuff! Not that *I* don’t know my stuff, (because most times I do!) but it really helps to have my opinion confirmed by professionals. Olive oil can make potatoes a wee bit bitter. In this world where everyone slathers olive oil on everything because it’s healthier, we forget that it also adds flavour and a quite bitter one at that. So that’s what sets my baked potato recipe apart from the others, and it really does make a difference you guys! How do I clean a potato before I bake it? Wash the potato under cool running water and gently scrub the dirt off. Try not to remove the skin by scrubbing too hard, we want the skin to remain! Dry gently with a paper towel, again, trying not to remove the outer layer of skin. Pat with paper towels until the potato is dry. You want the potato to be dry so that when you rub the oil on it, it will absorb into the skin better. Follow the remaining recipe instructions. What Type of Potato Works Best for Baked Potatoes? 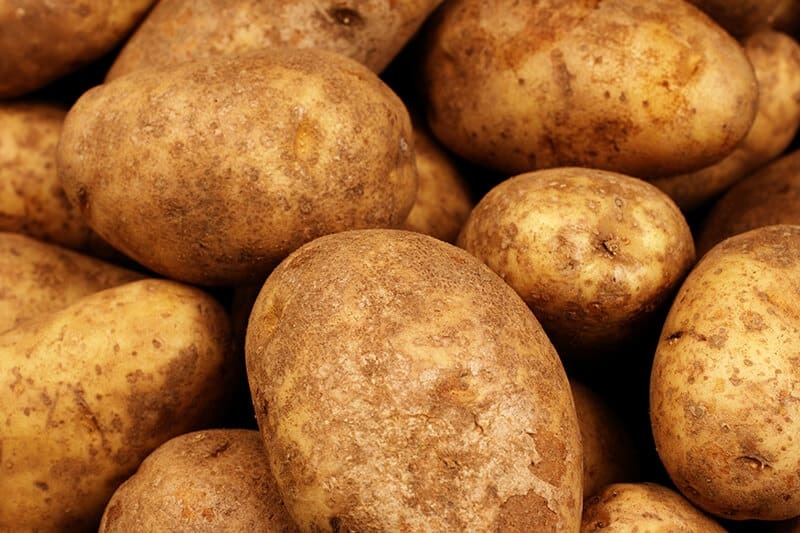 All-purpose potatoes ( example:Yukon Gold): Good for roasting, mashing or baking. Waxy potatoes ( example:red-skinned potatoes): Red potatoes are the best for soups and salads because they hold their shape after being cooked. There are many recipes that boil then smash red potatoes, so they are also great for crashed potatoes as well! How do I make a quick baked potato? There is a trick to making fast baked potatoes that aren’t quite as good as fully baked but will still finish in the oven, and that’s using your microwave to start out the cooking process fast. This does remove about 50 minutes of baking time! Pre-heat your oven to 400 °F. Microwave 2-3 clean, fork-pierced potatoes for 4-5 minutes ( depending on size). Remove carefully and place on baking sheet . Brush them with olive oil all over, then sprinkle with sea salt. Bake in the oven for 10-15 minutes until the potato is tender enough to be pierced with a fork easily. Cut a slit in the top of the potato and push the ends inward to open up. Serve and enjoy. Do I bake potatoes with or without foil? Is foil faster? It is thought that baking potatoes in foil speeds up the cooking process, but for my crispy skinned potatoes, you must leave the foil off. If you enjoy potatoes that are soft skinned, then you will wrap them in foil and bake them to achieve that result. However this is all about getting that salty, crispy potato skin on the outside that is so darn amazing! Preheat your oven to 400 °F. Pierce each potato 3-4 times with the tines of a fork. Coat each one well in canola oil, then sprinkle heavily with flaked sea salt all over. You need to get a good crust of salt. Place on a wire baking rack in the middle of a baking tray and place the potatoes on top. Bake in the oven for 60-75 minutes or until they are fork tender. Remove and cool slightly on the baking sheet. Microwave baked potatoes will NOT have that amazing crispy exterior that most people are looking for in their baked potatoes but let me tell you, when you are pressed for time making baked potatoes in the microwave is the best time saving trick ever! Take the cleaned potatoes and pierce with a fork several times. Place them on a plate and if you are lucky enough to have a baked potato button on your microwave, use it and choose the correct amount of potatoes. If you don’t have that option on your microwave, microwave the potatoes on high for 6-7 minutes to start, then carefully turn them over. Microwave in additional 3 minute intervals until the potato is fork tender when pierced. Why would a baked potato explode in the oven? Do I have to pierce them? Baked potatoes can explode when steam builds up within them. This is the reason why piercing them with a fork is incredibly important before cooking in the oven or microwave. In fact, it’s not even the oven that you need to be worried about ( other than a mess to clean up!) I have heard it from chefs that potatoes can explode AFTER you take them out of the oven – and potatoes have exploded on chefs. Ouch. Pierce the potatoes for safety’s sake! Here are some of my favourite potato recipes on this website, from soups to salads to main dishes! We love a good feast of potatoes! To serve, once they are warm cut a slit lengthwise down the top of the potato, not cutting to the very end however. Serve these baked potatoes with steak using my Steak Marinade recipe or my Amazing BBQ ribs. We also love to make my BBQ Root Beer Slow Cooker Brisket which is my favourite brisket recipe ever! 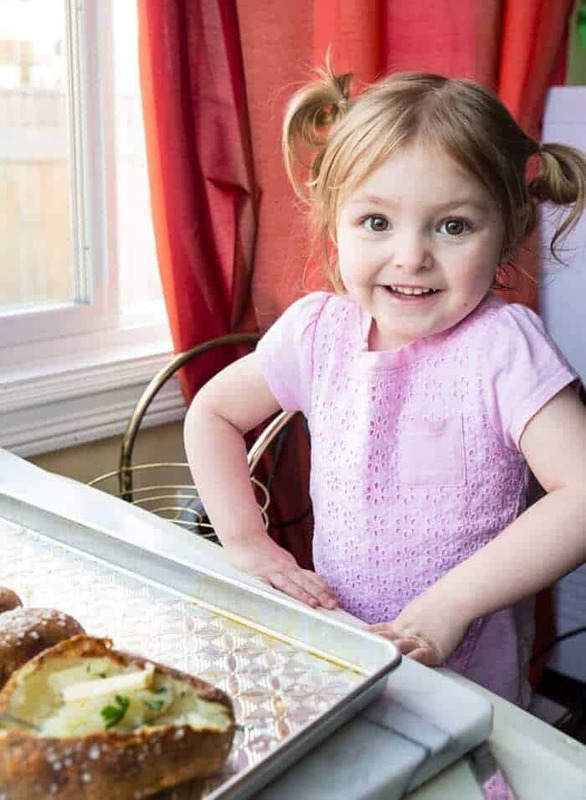 my niece enjoying baked potatoes, her favourite food! Use canola oil. Yes, I know that everyone uses olive oil but here’s a secret: restaurants know that olive oil can give high-temperature baked goods a slightly (or quite) bitter taste sometimes. More than one of my professional chef friends have sworn up and down this is how you make potatoes that are crispy and not bitter. Too easy, right? It can depend on the quality of the oil, how long it’s in the oven but the best way is to use a neutral flavoured oil for the best taste possible. Buy a nice cold-pressed canola oil and see how amazing it is! Here is a really good, seemingly non-biased article on canola oil, it’s very enlightening. Bake these on a wire rack to get the air circulation under the potatoes as well. Allow yourself extra time. I laugh at recipes that tell you potatoes are baked in 45 minutes – never, ever have I been able to do it! I don’t know what’s wrong with me, but mine take a solid 60-75 minutes every single time. Sea salt is going to rock your world on these potatoes. We demolished the potato skins like a pack of wolves and the skins are where most of the nutrients are! While these baked potatoes are really good loaded up with everything like sour cream, bacon and cheese, I do beg you to try these with just some butter and pepper. Not only does it keep the calorie count down if that’s a concern, it really allows you to enjoy the actual flavour of the potato and skin. Plain, simple and delicious. Pin This Recipe to your Side Dishes & Appetizers Boards and Remember to FOLLOW ME ON PINTEREST! 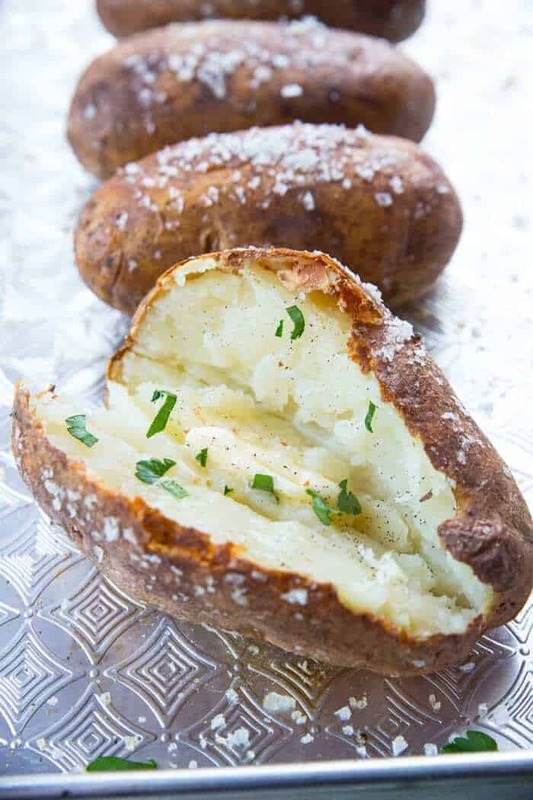 If you are looking for restaurant quality,salty, crispy skinned baked potatoes, here is how to make the BEST baked potato - with a few secret tricks of the trade! Coat each one well in canola oil, then sprinkle heavily with flaked sea salt all over. You need to get a good crust of salt. Place on a wire baking rack in the middle of a baking tray and place the potatoes on top. Serve with butter and pepper, or any and all toppings! These Baked Potatoes are great loaded with butter and green onions to keep it simple, but can be topped with bacon, cheese and sour cream. Try them with chili on top, they are fantastic! Can we travel 15 minutes with them and somehow keep them crispy? First thing- yes on the canola oil. Olive oil is best fresh and not heated and yes it gets bitter. Why do do many baked potato recipes use it? Why ruin a tasty baked potato? Second thing- AMEN TO THE CRUNCHY SEA SALT SISTER. Third thing- thank you for being real about the baking time. My potatoes take twice the time to cook and I don’t know why but I hate when recipes tell you they are 45 minutes. Mine are always crunchy still. These are my go to for summer now, Magpie you rock as always. Thanks for letting us know! I make these baked potatoes with steak during the summer, so easy! These potatoes are amazing, the best I’ve ever tasted! Thank you. These were delicious with our Christmas dinner, thanks. I love baked potatoes. These sound so amazing I can’t wait to try them. I just have to buy the flaked sea salt. And the baking potatoes! I hope you love them!! Those look delicious! I don’t typically think of starting my baked potatoes in the microwave but I love how much time that saves. Pinned. One stop shop for all I need to know! Pinning!! I need to try this! Thanks for all the tips! This is seriously such a great post!!! Loving it! Baked potatoes are my weakness! Love these crispy skins! I love a good baked potato! I’m so loving this guide! Canola oil is totally the way to go! It IS! That’s why the potatoes in restaurants taste SO good, the natural potato flavour is all you taste, not olive oil! I’ve made salt-baked potatoes in a crockpot before – put an inch of coarse salt in the bottom, pierce the potatoes and lightly coat in oil, then place in the crockpot and cover completely with more salt. Pierce the salt crust when done and the salt can be re-used; the best home-cooked potatoes I’ve ever tasted. Can I use another kind of poatato for these? You can use anything called “baking potato” on the package or labelled in the store. Those are the best for making baked potatoes. ten out of ten!!! This is my go to recipe from now on, thank you! Great to hear! Thanks for telling me! These are like Red Lobster’s Salty potatoes!! HA! NOW I know how to make them at home! You area genius! That’s where I have seen them, these are like their salt crusted potatoes that we love at red lobster. So the secret is canola or vegetable, right? Can I use something like peanut? These were awesome, thanks Karlynne! THANK YOU for catching that! My mind says one thing and my fingers type another, it happens all the time! Canola oil ALL the way!